An NYC native, journalist Mara Hoberman lives in Paris with her husband and adorable toddler, already an experienced world traveler. 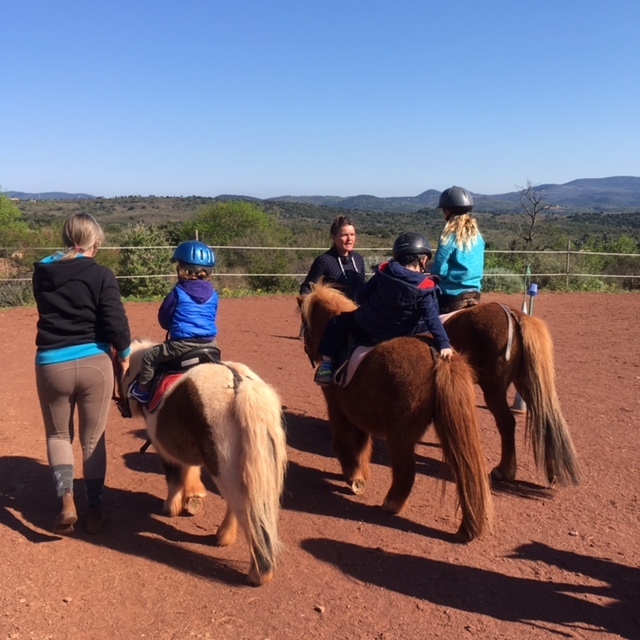 Mara is also expecting her second child soon, so for a final family adventure, she and her brood skipped down to Country Kids, a picturesque French farm resort near Montpellier in the Languedoc-Roussillon region. Read on to see why the Passported team is now pining for some clean country living. Having lived in France for nearly five years, I had heard from friends and colleagues about “agritourisme” (farm-stays), where you can holiday at a working farm. Although I do not personally find the concept of being woken at dawn by roosters or learning how to milk a cow particularly appealing or relaxing, it all sounded like heaven for my animal-obsessed two-and-a-half-year old son. So, with spring break coming up, I decided to look at possibilities in this vacation sub-genre that just might please us all. At seven months pregnant, I was not willing to even attempt roughing it, so I wishfully Googled: “luxury-farm-stay-France.” The first hit that came up, Country Kids, seemed almost too good to be true. Had I stumbled upon the Club Med of farms? My fantasy morphed into reality as I read more about this all-inclusive resort-style country farm claiming to be “a paradise for kids, a holiday for you.” On its website, Country Kids describes an on-site daycare for the wee ones (3 months–4 years,) a kid’s club for ages 5–12, a spa, a private chef, daily housekeeping, and acres of farmland to explore. Miracle of miracles, this renovated 19th century Roquefort dairy in the south of France (bonjour, wine country!) seemed to tick all the boxes for our ideal family getaway. With four 3-bedroom apartments and one 2-bedroom apartment in the Old Dairy, a 5-bedroom Farm House (perfect for a family reunion or friends traveling together), and a 2-bedroom cottage, Country Kids is the size of a boutique hotel and can accommodate 16–18 adults and 18–20 children. On-site activities for kiddos include mini-golf, a heated pool with waterslide, tennis, a mini soccer field, a zip line, a trampoline, and of course the farm animals (goats, pigs, sheep, chickens, bunnies, donkeys, and a horse, are just a 5 minute tractor ride away and the kids go with Sylvain to feed them every morning.) For the adults, there is an on-site wine cellar that hosts wine tastings from local vineyards, yoga, a spa, an adults-only pool, and excellent childcare at the crèche or kids club from 10am-5pm. We booked the 2-bedroom apartment in the “Old Dairy” and started to count down the days till our vacation. Thanks to a simple pre-arrival form, I was able to let Country Kid’s private chef know about our family’s various diet restrictions (mostly my own pregnancy-related ones) and was assured that substitutions would not be a problem. Given that we would be arriving in the late afternoon, Sylvain proposed stocking our fridge and freezer with gourmet foods, so we wouldn’t have to run to the supermarket. Meandering over to the side of the windy road as we made our way up into the beautiful hills of Languedoc region, a friendly and inquisitive heard of donkeys were first to welcome us to Country Kids. Five minutes further down the road, past the barn and a picture perfect blue and orange tractor, the farmer and his wife greeted us at the entry gate. My husband and I took in the beautiful landscape of olive trees and fragrant jasmine while enjoying refreshments while Julian, our son, immediately ran off to play on the pétanque court with Laure and Sylvain’s children, under supervision of their English-speaking nanny. Right from the start, everyone was warm, welcoming, and relaxed. 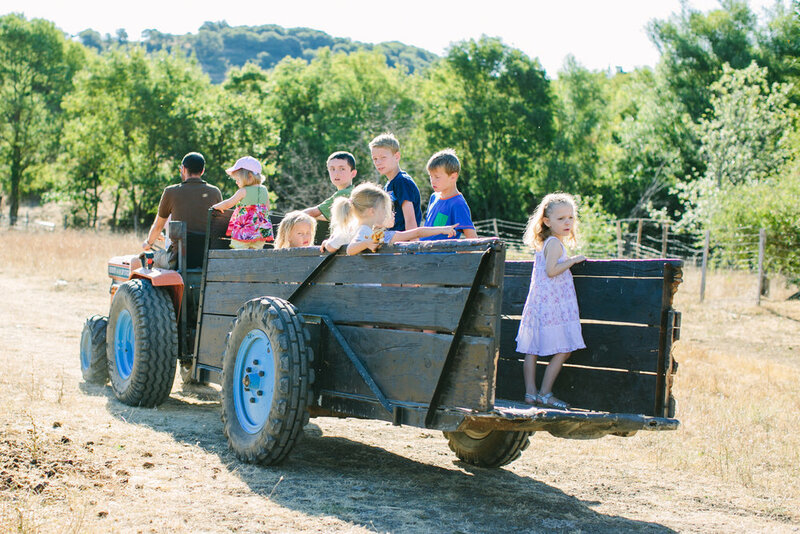 Unlike other upscale resorts in France, the vibe at Country Kids is refreshingly casual. There is no “Madame” and “Monsieur” pretentiousness and, in fact, all of the guests’ first names were written on a chalkboard next to the bar/general store, which serves as a hub where guests can always get hot and cold drinks, snacks, frozen meals, and information from staff. We toasted the start of our vacation with some of the other arriving guests and then checked into our spacious two-bedroom apartment. My husband and I were excited to see the large Jacuzzi bathtub with a view over a blossoming chestnut tree, while Julian immediately got to work inventorying the chest of toys in his room. The next morning we were visited by Country Kids’ concierge, Alice, who had great suggestions for activities to keep us entertained, well-fed, pampered, and relaxed on- and off-site. We booked a pony ride for Julian, a spa treatment for mama, and chose two restaurants for date nights (during which Country Kids provides complimentary babysitters.) Then, it was off to the crèche to introduce Julian to the staff and other kids. I must say, I was skeptical whether he would be willing to leave us much during the vacation, but once he saw the soft play area and child-size tractor, he could barely be bothered to wave good-bye. “Go enjoy lunch by the farm house,” said one of the crèche staffers, “We’ll play, feed him here, and then have a nice nap.” I winced, thinking about how my husband and I struggle to get Julian to sleep—especially in a new place, filled with new faces and excitement—but decided to go with the flow. Later, as we were tucking into a delicious cassoulet prepared by chef David and served en plein air in front of the Old Farmhouse overlooking the swimming pool and verdant grounds, an envoy from the crèche came by to discretely let us know that Julian had eaten well and fallen fast asleep. I felt myself relax deeply. This just might work! And work it did. For me, our week at Country Kids was the most relaxing vacation I’ve experienced as a mother. The childcare staff and facilities are top rate and Julian was happy going off to crèche everyday from about 10–4:30, when a happy hour/snack is served to all guests. Each time I dropped him off, I told him he could always ask for Mama and Papa to come get him. He never did. Between BBQ picnic lunches, bike (er, trike) riding, the sandbox, the jungle gym, animal grooming, the soft-play ball pit, and small “hikes,” he was having the time of his life. The added bonus: my husband and I had time to read, swim, spa, relax, and reconnect. When it was time to get Julian after crèche we were refreshed and excited to hear what fun activities he had been up to that day. A week at Country Kids can include as much or as little activity as you like. Most guests stay one week, though the lucky ones book for two. In the low season (April–June and September–October), everything is à la carte from activities to meals (childcare is always included.) Lunch can be ordered from the chef and served anywhere on the property and at dinner you can order chef-prepared frozen meals or self-cater using food from the small, but well-stocked on-site market. For those who enjoy cooking, I highly recommend going to the weekly marché in nearby Clermont-l'Hérault (Wednesday mornings.) We came back with delicious produce, cheeses, and meats that lasted us for most of our stay. 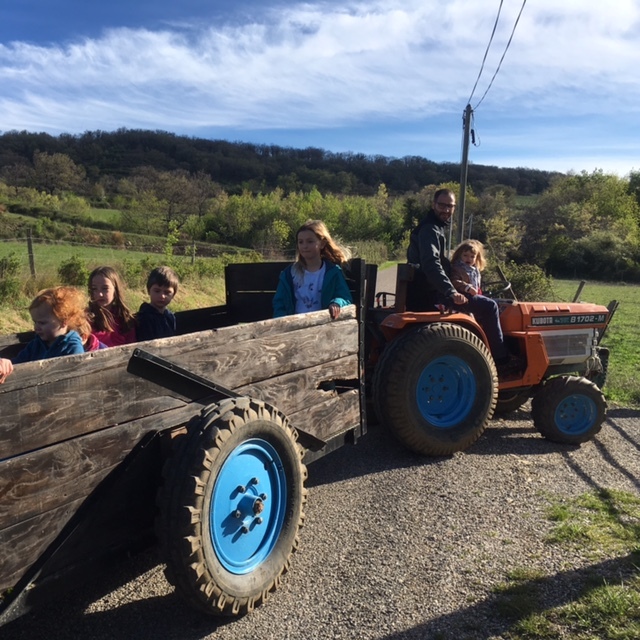 For those who have never visited this region of France before, a trip to Country Kids during the low season has the advantage of leaving you feeling free to take some excursions off the farm. (During the high season the package is truly all-inclusive and you may not want to venture off-site since you are paying for all meals and activities.) Within easy driving distance you will find charming villages, like medieval town (and UNESCO world heritage site) Saint-Guilhem le Désert, and many natural attractions (Lac du Salagou for swimming, paddle boats, sailing, etc; the Hérault river for summing and boating; and Mediterranean beaches where Country Kids can book you access to a private beach club, if so desired.) There are more than a few Michelin-starred restaurants in the region and oyster lovers won’t want to miss a meal in the picturesque port of Meze. One of the best meals we had was at the unassuming restaurant La Palombe, which happens to be within walking distance of the farm, in the tiny town of Octon. During the busy and coveted summer season, Country Kids, kicks into high gear and becomes an all-inclusive resort with all food, wine, spa treatments, and more built into a week-long package. High season (July and August) rates are about twice as expensive as during the low season, but for those who don’t want to budge during vacation, this period is best. Wine-lovers, for example, won’t have to venture off site in order to sample the region’s vintages. Sylvain’s cave, stocked with local wines (except for champagne, mais bien sûr), is open 24/7 and one evening per week, Country Kids hosts a wine tasting and tapas party. The talented, friendly, and knowledgeable staff was attuned to the needs and desires of guests of all ages. Finally, we were able to travel light! Country Kids’ baby-proofed apartments come ready with whatever gear you might need. Check in with Laure in advance and everything from a baby bath, crib, and high chair to a shelf full of English books and an age/gender appropriate toy chest will be ready for you at check-in. The pool house is stocked with swimmies, kickboards, hula-hoops, beach balls, swim diapers and (shhhh) ice cream! Julian absolutely loved “driving” Famer Syl’s tractor down to feed the animals each morning. He proudly took a bucket of our food scraps (each apartment is equipped with such a bucket) to feed to the pigs, sheep, and goats. Another exciting morning ritual for the kids was collecting fresh eggs from the chicken coop—we had the best omelets ever during our week at Country Kids. With so many return guests, Country Kids books up far in advance. Many families book a year in advance, or more, to be sure to they get a spot in the high season. Sylvain is already taking bookings for 2018, so don’t delay! Coming from Paris, Brussels, or the UK, travel to Country Kids is relatively easy by air or train to Montpellier or Carcassonne where you will want to rent a car for the week. Those coming from the US may find that connecting flights and trains, make for a more complicated arrival and departure. Think about combining a week at Country Kids with some time in London or Paris on either end of the trip. Country Kids encourages socializing among guests (adults and kids alike) with group activities and meals planned throughout the week. Though it is possible to keep to yourself if you wish (there’s always a quiet nook to read a book or catch a nap), families who definitely do not want to mix and mingle while on vacation may not enjoy the tous ensemble ambiance. Country Kids may be the size of a boutique hotel, but the décor inside the apartments and houses is not super chic. If interior design is an important factor in your vacation happiness, think twice before booking as the furnishings are comfortable, but certainly not the main focus of the resort. The vibe is country cute and comfy, not shabby chic or chateau luxe. This well-preserved medieval village is along the pilgrim route to Santiago de Compostela in Spain and is classified as a World Heritage Site by UNESCO. Kids will love exploring the car-free cobble stone streets and racing France’s largest plane tree, which graces the central square (a charming spot to enjoy a crêpe or ice cream.) New Yorkers will be interested to know that part of the cloister from Saint-Guilhem le Désert’s gorgeous monastery was moved to the Cloisters Museum in 2009. The weekly local markets in Lodève (Saturdays) and Clermont-l'Hérault (Wednesdays) are great places to stock up on farm-fresh produce and regional delicacies as well as souvenirs like woven baskets, local pottery, herbs de Provence, lavender soaps, and Camargue salts. Our philosophy at Passported is take your kids everywhere. So when we connected with Niels and Emma van Gijn via their gorgeous Instagram feed @silverless, we immediately loved them. This UK-based couple managed a luxury safari camp in Botswana's Makgadikgadi Salt Pans and honed their photo skills documenting a six-month drive from Botswana to the UK. When they had children, nothing changed, apart from a bag of nappies. Now based in the UK, the family still hits the road frequently, with adorable Inigo (now four) and Oriel (now two) along for the ride. Read on for their smart take on why a 10-month-old is no reason to skip a trip, and to see Niels’ beautiful photos. Katerina Panayotopoulou, an Athens native, mama of one (with one on the way) and travel pro, shares her tips and places to discover in Athens energy-filled streets. Travel-loving mom and author Isabelle Demenge shares our philosophy that there's no such thing as a non-kid friendly place. Her Leap and Hop children's travel activity books are the perfect companion for your little one—or ones—on your next big adventure. With plenty of adventuring and parenting under her belt, we couldn't resist asking Isabelle just how she does it all. Read on to hear Isabelle's story, including an inside look at some of her fave secret spots and her recommendations for Hong Kong, the city she now calls home. Another day, another city to explore, and Copenhagen is one of our favorites. Hallie Burton, founder of our go-to line for easy-to-wear and stylish pieces for kids and adults SMOKKS, gives us insight into all the best shops, yummy restaurants, and sites to see when visiting Denmark's beautiful capital city. English expat, Lauren Mansell is a Manhattan mama on a mission to make your date days and nights even better with her app, Hello Sitter. With Hello Sitter, you can hire pre-vetted on-demand babysitters with the tap of the screen. So what will you do with all of this free time? Lauren has some ideas. Read on for her date night picks. TriBeCa dad and badass photographer Michael Edwards has a mic-drop resume, which includes spreads in every mag that matters (Vogue and Glamour, to name a couple). Plus, he's the man behind the lens in the inspirational new Swimsuits for All campaign #beachbodynotsorry. When we got the opportunity to chat with him, we couldn't resist asking our most embarrassing photo questions, from the best way to take flattering family photos to what apps can make our vacation pics look like a fashion mag. Oh yeah, and we wanted to know his favorite places to travel so we can roll like the Edwards crew (hint: swimsuits are involved). Read on for his picks, including the a secret must-buy souvenir in Nosara and the best place to grab a drink in downtown Manhattan. Mini Magazine is one of our favorite resources for all things new and cool for style savvy parents. We love Mini's vision and advice, so we reached out to Kaitlyn Kirby, founder and editor-in-chief of the online mag, to get her take on travel and running a business. She dished on everything from the inspiration behind Mini to her ultimate travel uniform, and of course, what it's like to run two magazines at one time. We'd all like to think that our lives look rosier through Instagram filters. Despite the effortless feel, it does take a little (read: a lot) of skill to master the ultimate #photoftheday. So we tapped the Instagram queens from one of our favorite feeds, Heymama and got them to spill their secrets for the perfect photo finish. Passported recently sat down with Michael Miller, founder of the New York and London Meditation Centers to get his guidance on how to kick-start a practice. It’s less complicated than we thought.